Last weekend I headed out to San Antonio for my discipline's national conference. I knew the trip was off to a great start when I sat behind this fellow on the plane. Seriously, this is the best tattoo ever. And, it made me smile every time I looked up. Yes, I'm easily amused and I don't habituate easily. Lawn mower head man, if you ever read this, thank you for bringing more smiles and levity into the world. You seriously rock, dude. As usual, I loved going out to the conference. It's some serious nerd candy, but learning about new research, and walking down the conference halls talking and hearing about new paradigms and theories is pretty dang hot. Plus, the conference provides a great chance to catch up with friends from other schools. I even got to meet my friends', Hilary and Steven's, little (big) guy. He was quite the charmer, and I seriously love his dinosaur jammies. I also got to live it up with my bestie and brother-in-law (who coincidentally decided to go into the same discipline as me). We all partied as only social scientists know how to do (no seriously, the conference parties are pretty fun, complete with DJ-ing and dancing faculty). You probably can't tell who it is from my super far away and grainy photo. It's Malcolm Gladwell! Of course no conference is complete without me getting sick at the end, and I've been hacking up a lung for the past week or so. So here is my sickly OOTD! I've been hunting for this shirt ever since I saw it on Jean of Extra Petite so when someone offered a NWT on the JA boards, I jumped at the chance. I'm totes amused that my hubby knows my sizes. Evan emailed me when he got the Paypal invoice to say that he thought that a size 4 would be way too big on me, lol. Don't worry love, I easily took in the sides! And I'm throwing in this last picture, because I find my befuddled why-isn't-my-remote-working expression so completely humorous. Aw, it's nice to see Budz standing by your side. You may feel sick, but you don't look it. The turquoise Caballo Falls looks phenomenal on you, Lori! Welcome back Lori :) Budz is looking so much better! I am glad you tracked down the caballo falls dress, it looks fantastic on you. Your second otufit is great too, the colour of the blouse is perfect with the blazer. 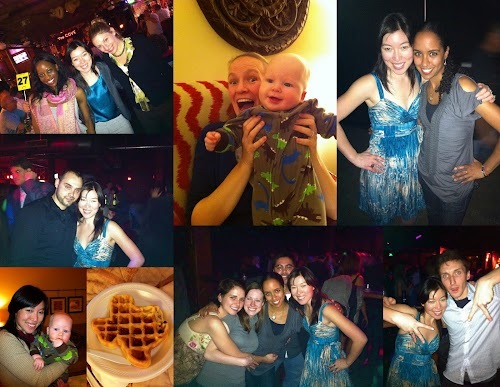 Baby and texas waffles, how adorable! So glad you are back Lori. I am glad Budz is better. Really love that fellow's tatoo. Great sense of humor! Hey Budz is back! He's looking well Lori. And you look good as well, even though you don't feel so great. I have no idea who Malcolm Gladwell is - sorry! That tattoo on the man's head is pretty cool! @Tien & @Jess, I know!! I'm so happy to have Budz back up and about! @Inkmark Seems like he'd be a fun person to know! @Gabby San Antonio was great! I was also so amazed how clean it was everywhere. Y'all do a nice job with your city! @vintageglammz Malcolm is an author/journalist who has been integral in communicating a lot of science's exciting findings to a more general public audience. Wow, I knew you'd look great in the Caballo falls! =) Lovely coloring!